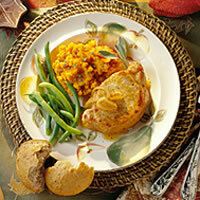 Serve up the flavors of autumn with these chops braised in a savory apple mixture. Season flour with a little salt and pepper; lightly flour pork chops and brown on onion side in butter in non-stick skillet over medium heat. Turn chops; stir in onion and apple juice; bring to a boil, lower heat, cover and simmer for 7-8 minutes until internal temperature on a thermometer reads 160° F.
Serving Suggestion: Serve winter squash purée and buttered green beans.